Napoleon Bonaparte is one of the most famous men from French history. Having conquered large areas of Europe in the 19th century, the military man is now brought to the reels in Napoleon Rise of an Empire slots from Blueprint Gaming. It is a 5 reel slot with 3 rows and 20 fixed paylines. Behind the gold-framed reels you can see Napoleon leading his men into battle on horseback. There are four high value symbols, a soldier, a ship, a horse, and a cannon. The lower value symbols are the playing cards 9 through to A.
Napoleon himself is the wild symbol, he will substitute for all of the other symbols, except for the bonus symbol, to help and form winning combinations. The bonus symbol is a golden medal. If a winning combination includes one, two, three or four wilds it will receive a multiplier of 2x, 4x, 8x or 16x respectively. On any spin the Battle Cry may be triggered and award one of two bonus features. Either extra bonus symbols will be added to the reels to help and trigger the main bonus or extra wild symbols are added to help and form bigger wins. When the gold medal bonus symbols land on reels two, three and four simultaneously the free spins begin. 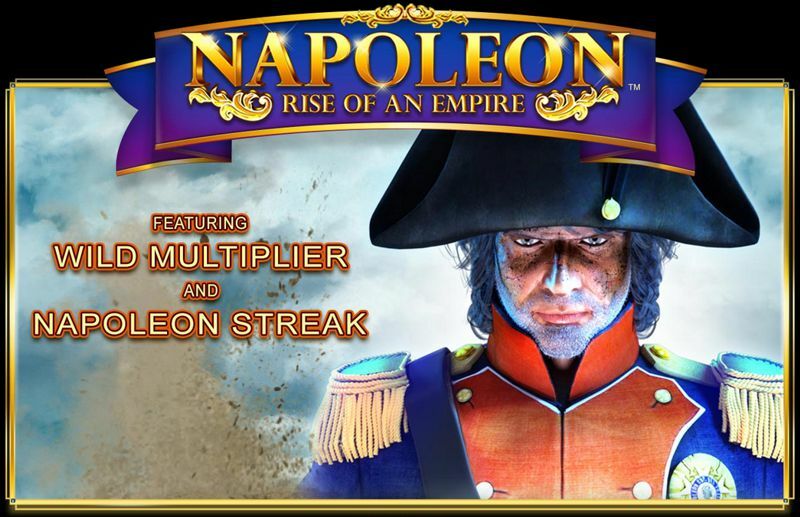 Initially you are awarded ten free spins with the Napoleon Streak feature. During the spins any winning symbols are held in place and an extra spin is awarded, if more matching symbols land the process will continue until there are no more and the payout is then evaluated. Best of all, you can retrigger the free spins by landing three more bonus symbols on the reels. 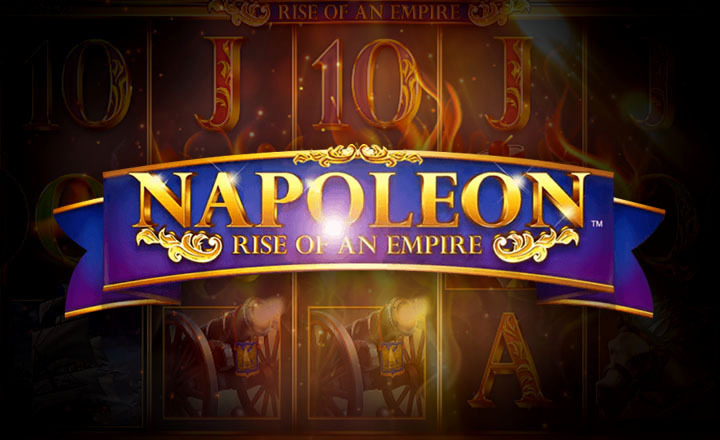 Napoleon Rise of an Empire has a betting range of £0.20 up to £40 per spin so it is suitable for all budgets. There is an incredible top payout of 100,000x for landing five wild symbols along a payline. The soldier can payout up to 4,000x, the ship up to 1,600x, the horse up to 640x, and the cannon up to 480x. A and K can payout up to 320x, Q and J can payout up to 160x, and 10 and 9 can payout up to 80x. Why not go for an adventure with Napoleon today and see if you can bring back some of the spoils of war. Ancient Greece is a popular theme for online slots but each developer offers a different take on the subject and now Play N Go has released their version. It is a feature packed game that gives you the chance to win some huge payouts. Rise of Olympus takes place on a 5 x 5 grid and the aim is to form combinations of three or more matching symbols horizontally or vertically anywhere on the reels. The game is specifically based around the gods Hades, Poseidon and Zeus, and one of them will always be standing to the right of the reels. The three gods are the game’s high value symbols, and they can even form mixed winning combinations. The lower value symbols include a harp, a helmet, a trident and a bolt of lightning. The gold coin is the wild symbol, it is formed whenever a combo of three matching symbols land on the reels. The wild can then substitute for all of the other symbols to help and form more wins. If new wins are formed the process will continue and each successive win will increase the payout multiplier. After any non-winning spin the Hand of God feature may be triggered. This will vary depending upon which god is standing by the reels. Hades will transform all instances of one symbol into another to help and form more wins. Poseidon will add up to two wilds to the reels. Zeus will destroy two sets of symbols and remove them from the reels. To the left of the reels you will see a meter that has three sections. These sections are filled by landing combinations of god symbols. Three gods will fill one section, four gods will fill two sections, and five of a kind fills the entire thing. When the meter is full the Wrath of Olympus feature begins. You will receive a free spins in which all the gods will award the features described in the Hand of God. Hades– You win four free spins with the Hades Hand of God feature active on every non-winning spin. If you fill the meter you win four extra spins up to a maximum of twenty. 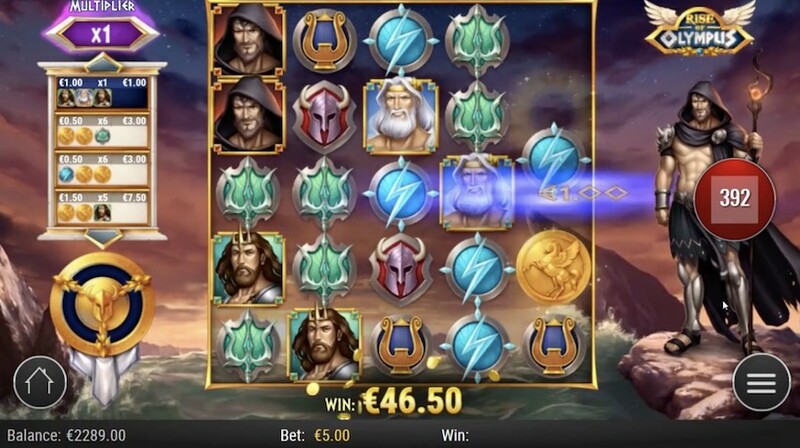 Poseidon– You win five free spins with the Poseidon Hand of God feature active on every non-winning spin. If you fill the meter you win three extra spins up to a maximum of twenty. Zeus– You win eight free spins with the Zeus Hand of God feature active on every non-winning spin. If you fill the meter you win two extra spins up to a maximum of twenty. Rise of Olympus has a betting range of £0.20 up to £100 per spin so everyone can enjoy it. There is a top payout of 50x your bet for a group of five wild symbols. Zeus, Poseidon and Hades can all payout up to 10x while a mixture of the three can payout up to 5x. The harp and helmet can both payout up to 3x while the trident and lightning bolt can both payout up to 2x. Why not travel back and spend some time with the Ancient Greek gods, with a bit of luck they will bestow great riches upon you. If you enjoy medieval stories of kings, queens, nights, great battles, and huge riches, then you will love Barcrest’s new slot King’s Honour. King’s Honour features two sets of reels, both of them with 5 reels. The left set of reels has four rows and the right set has twelve rows. In total there are 100 fixed paylines. Generally the reels work independently from one another, except for when a stack of four wild symbols lands on the left set, they will be duplicated on the right set. The high value symbols include the king, the archer, the silver cup, Stonehenge, the axes, and the golden crown. The playing card suits are the lower value symbols. There is a large ‘Wild’ symbol, it can substitute for all of the other symbols, except for the bonus symbols, to help and form more winning combinations. The bonus symbol shows the sword in the stone. Wild Arrows– Up to forty symbols are turned wild for one spin. Flaming Wild Arrows– Up to forty symbols are turned wild and locked in place for up to three respins. Extra Free Spins– Awards between three and twenty-five extra spins. Black Knight– Transforms lower value symbols to higher value ones. White Knight– Transforms lower value symbols to higher value ones and wilds. Colossal Win Multiplier– Applies a multiplier of up to 5x to any right hand reel wins and up to two respins. At any point while playing the slot the King’s Charge bonus can begin and you will see random symbols transformed into matching ones for a guaranteed win. There is also a Siege Spin Bonus that can award a free respin if two bonus symbols land on the reels or a free respins if a stack of four wilds lands. The slot also has a Big Bet feature. You can spend £20 for a spin in which any wild on the left will expand to fill all positions and transfer itself to the right reels. Alternatively, you can spent £30 for a spin and receive the wild feature and extra bonus symbols. King’s Honour has a betting range of £0.10 up to £500 per spin so everyone can enjoy it. The king offers the top payout of 500x, the archer can payout up to 400x, the axes and the crown can payout up to 200x, and the cup and Stonehenge can payout up to 150x. Go on this medieval adventure today and with a bit of luck you will return with some huge payouts.